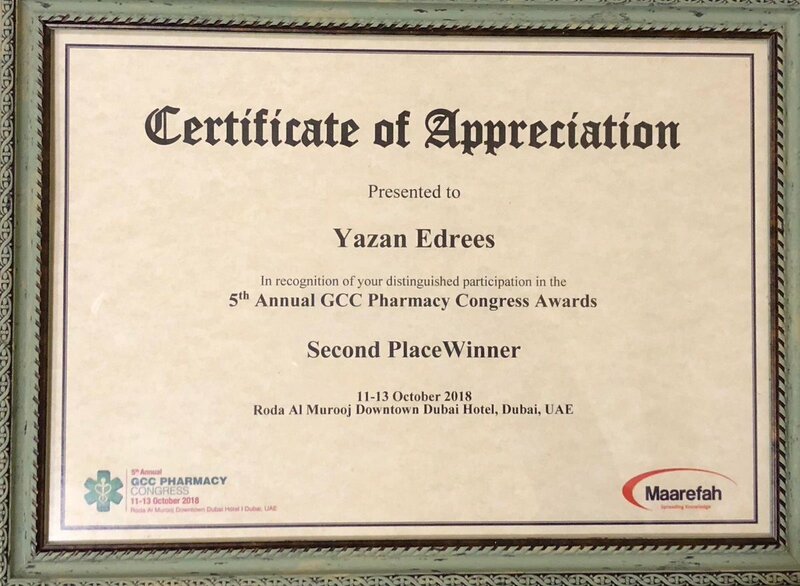 Within the framework of its distinguished participations in the domain of scientific research, the College of Pharmacy was awarded the second prize in the Fourth International Conference on Pharmacy Practice Research in the domain of Clinical Pharmacy. 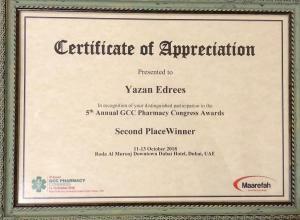 The event was held in Dubai, United Arab Emirates under the title, "the 5th Annual GCC Pharmacy Congress." 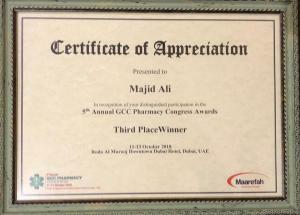 In this context, the College participated in the event with the research submitted by Dr. Majid Ali, Staff Member at the Department of Clinical Pharmacy. The researches were awarded the second and third prizes within the list of clinical research participating in the conference. They were entitled, "Effect of Medication Adherence, Diabetes Knowledge and Beliefs about Medications on Glycemic & Lipid Control," and "Medication Related Problems in Diabetic Patients." It should be noted that the distinctive participation by Dr. Majid Ali was a group of winning student graduation projects by Yazan Idris, Jalal Abdussalam, Rayyan Al-Labban, Iad Bukhary, Yusuf Ketby. Hamed Ulwy, Abdurrahman Al-Thaqafy, Muhammad Al-Otaiby, Walid Al-Maleky, Walid Al-Luqmany, Fahd Al-Dhubiany (Boys Section), as well as Anwar Al-Hazemy, Amjad Al-Beishy, Amjad Mudkhaly, Layal Bayunus, Razan Al-Hazemy and Ilaf Doman (Girls Section). On the other hand, the main aim of the conference was to draw attention to recent developments in health care in the GCC states towards a more focused model on patient health. 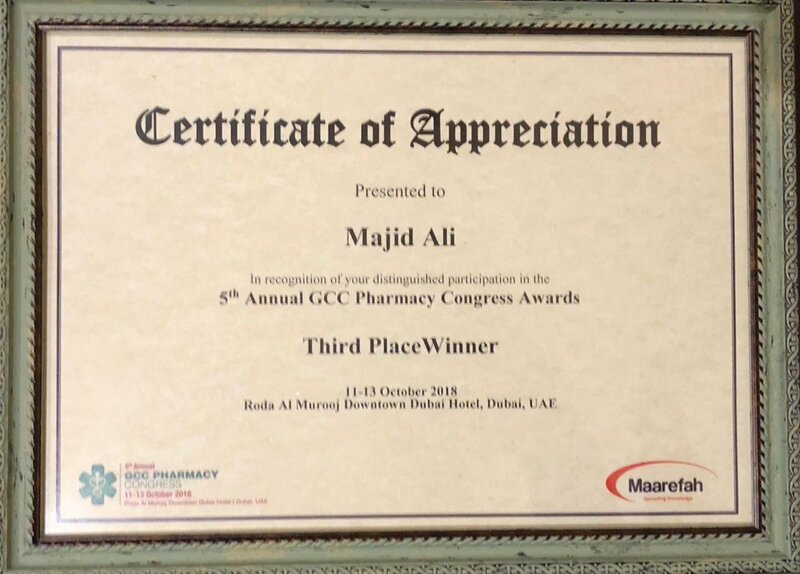 It is worth mentioning that the conference mainly aimed to shed light on the increasingly significant role of pharmacists in the provision of ideal care for patients. This was as they played a significant role within the health care team. In other words, they contributed to the enhancement of care outcomes, reduction of therapeutic costs, and improvement of pharmaceutical management systems in line with management strategies that measured the optimal performance of health quality.